There I was one day in the middle of the hot Florida sun. It was probably around 100 degrees and I was tasked by my boss to break up some of the footer (an inch or two) so that the drainage pipe could go out. So in the middle of a country field I took hold of the sledge hammer and went to work. It didn’t take me long to realize that slinging a 16 lb sledge hammer over my head was a great cardio workout. In-fact swinging the hammer seemed to give a more rigorous exercise than running for a few miles. I decided I needed one, but a price tag of fifty dollars seemed a bit much for a hammer and my checking account. So I waited. Then last Christmas I received a gift card from ​​The Home Depot​ for fifty dollars. My choices were to buy something useful or something for my workout. I chose my workout and finally bought one. Not only has the hammer proved itself practical for all kinds of work around the house, like removing a few unwanted posts, but it gave me a cool workout. Pawn shops are also great places to find one. For my workout I place a car tire on the ground in the yard and I use an over arm swing to hit the tire. 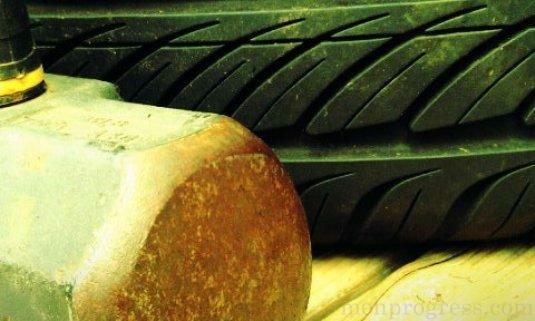 I beat the tire until I am worn out. Watch out for the recoil.